One of my New Year's resolutions for 2010 has to be to improve the timeliness of my blog posts. Knowing that it takes me, on average, two weeks to write about an event or to post a recipe after I've prepared it is just embarrassing. But life had to take precedence over blogging (*gasp*) as I searched for a new job after being laid off in August. Thankfully, after going through a very thorough interviewing process, I was offered a job with Scripps Networks. Beginning on December 28th, I will be working at HGTV and I cannot wait to start! 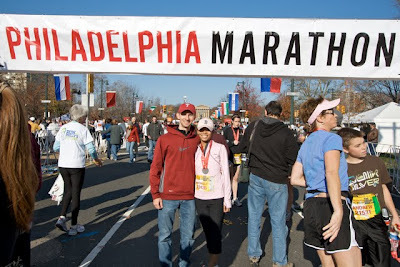 As you know, I relied on running as a means of stress-relief during my period of unemployment, which came in very handy since I was training for the 2009 Philadelphia Half Marathon - my first race at that distance. I was nervous that I hadn't trained hard or long enough and that I wasn't ready to push myself through 13.1 miles. But I had the wisdom of friends, including my friend Mary and my sorority sister Michelle (pictured above), to comfort me and to help quiet my fears as we all mentally prepared ourselves for the big race. 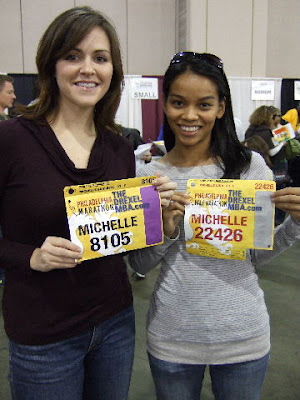 Michelle and I were staying in different hotels, so we wished each other luck and promised to try and find one another after the race for an "after" picture. I was staying with Mary and two of her friends, so after we picked up our race packets, we headed over to our hotel to check in and to finalize our plans for dinner. We ultimately decided to carbo-load at Pietro's on South Street because they offered a rather extensive menu and the dishes were all reasonably priced. We were famished by the time we got to the restaurant. After ordering our plates of pasta, we immediately started in on the bread and began drinking our bottomless glasses of water. Since there were four of us and we all wanted salad, we ordered a family-size portion of the Insalata Mista. I don't think any of us were really prepared for what came out of the kitchen. Just look at the size of that salad! As hard as we tried, we couldn't finish it all. Smart move because the individual pasta portions were just as ginormous. I ordered the Pasta Bolognese with spinach fettuccine. See those specks of green under the mound of sauce? Yeah, that's the pasta. It took a little work to find it, but the pasta was definitely under there! I found the sauce to be a bit on the salty side and, under different circumstances, I probably would have only taken a few bites of the pasta and then gone back to finish what was left of the salad. But I was running 13.1 miles the next day -- I needed the salt. My training and perseverance paid off. I ran the half marathon well under my goal time of 2:30:00 and crossed the finish line in 2:15:55! Stephen was there, cheering me on at Mile 6, and then again at the finish. When my legs finally stopped quivering like Jell-O, we posed for a shot under the Philadelphia Marathon banner, and when I got home to New York, I took pictures of my medal. I know I've already done this in person and on Facebook and on Twitter, but I want to thank everyone for their encouragement and support during my training. Although you couldn't all be there in Philadelphia on that cold morning in November, I knew you were all there with me in spirit. Thank you for making my first half marathon so memorable!